Will you realise some vehicles with Tuning mod stutf? I didn't understand, Tuning Mod is just a mod to mod vehicles (useful for people themselves can adapt VehFuncs in-game, but in the current version of Tuning Mod it is not possible to install pre-adapted parts, I'm still working on it). I'll adapt and release a car with that engine. How does bands work on GTA V? here you can see how it works on both cars and bikes. Maybe it is animated uv map, but I think for GTA SA it is better to do changing nodes, is not the most optimized way, but it is simpler and unlimited. I.e. several nodes that will be shown in a sequence, such as frames of an animation, and you would set the milliseconds. It would not be useful just for this, but it would be possible to create absolutely any type of animation, either by texture or by model. Probably in the next version I will do this, also a way to choose the sound of the vehicle using "Characteristics" (engine, horn, door...). Something interesting in various GTA V tuning is that the exhaust changes position. @fabio3 has already made possible to have an independent exhaust position for Tuning Mod v3, I could implement the same system in VehFuncs, but I think the vanilla exhaust system is horrible, it is always directed backwards, so probably would be better recreate the entire exhaust smoke system (just for adapted vehicles) to support directional smoke. This would also facilitate the customization of the size and color of the smoke (something that today is only possible with our Exhaust Tweaker, but the goal here is not to need configuration files, because, come on, nobody likes to install configuration lines when installing a new car). Wops, I was writing wrong. I mean will you release some vehicles your own with VehFuncs? I don't like the game tuning system, I find it very limited, I prefer to use Tuning Mod instead. I know it's not as simple as the vanilla system, but is fun to be advanced, I find it boring to go into a garage and do everything in 10 seconds. There are converted GTA V cars that use the tuning of the Tuning Mod and they are very good. Probably in the future I will do something to improve utilization and get closer to the original game system (for example the preview of the parts appearing in the car). The same as as I said above (animated parts). I don't know exactly how to do this in a good way, just moving them up/down is not enough, it also needs to rotate, right? In 307cc it got really bad. Made this quick review, I'm still working on it but I just wanted to learn how to adapt vehicles. .-Displaceable stuff in trailers & trunks: similar to the movement of the ladder on the fire truck variant from the last mission. But also similar to GTA V's utility trailer, moving from one side to other when turning quickly. .-Multiple shooting-to-explode points: to be applied on fuel tanks so we could make the vehicle explode by shooting there rather than just on the already present "classic" petrol cap. .-Animated tank cannon: self-explained but check this starting at 6:00. .-Tires gradually & randomly deflating: self-explained. This could also include the disabling of the shaking wheels when punctured. .-Fully working suspension: make the Bandito's advanced suspension work together with the Monster truck wheel physics. (I tried via data & model editing but the result was constant bugs with the animated parts). .-Vehicle design influencing handling: for example, a car with different engine blocks should have a different performance, that's also applied by the kind of extras it has, like a heavy load in a truck & van. Spoilers that actually improve traction and speed, etc. Even the count of passengers should influence weight. I know this one is a lot more difficult but I'm sure worth it. Something hard to do. How exactly would it be? The only good way I saw was using shaders to deform the tire, it was a nice effect but unfeasible for GTA SA (at least for me). Active dashboard does a good job? I don't want to mess with it right now, I don't quite understand how the suspension of the game works. I prefer to focus on more visible and practical things. This is easy, we can use "Characteristics" to customize the handling values, and done. Change the weight with passengers I think the difference would be too much small, nobody would notice. Thanks! I really spent a lot of time thinking about them, saying "what could Junior accept? just remember to suggest original stuff and visible features" so, glad to know my suggests are good. Hope to see any of them soon. My inspiration came from Mafia II (I'm a big fan of the Mafia series) where tires actually deflate almost in real time but also randomly & gradually (if I'm not wrong this also happens in Max Payne 3, where if you shot a tire, it will react in the same way Mafia vehicles does). Yeah, it's really hard to do, I mean, of course, there's a way but knowing the game's limits and your limits, it's better to leave it for the future. I prefer to focus on more visible and practical things. I'll keep that in mind well, everyone must do it. Physics on the wheels is really cool if it were applied to cars without this ugly hack (which in fact it's quite acceptable). The real problem is that the wheel tries to get over things that are too high. If I'm not wrong, vehicle Special Abilities, supposedly, allow us to use the advanced suspension on every adapted car we got in-game but the thing is that the mod is quite outdated. But who knows? we could probably contact Alexander Blade and ask him for the source of that .asi mod and, presumably, learn how to use not only the working suspension but also the rest of the unique vehicle functions already in-game. I think this kind of "bug" can be fixed via editing the collision file of the Turismo but that, of course, it's a temporary and barely esthetic solution. Wheels physics are really tricky after all. we can use "Characteristics" to customize the handling values, and done. Yeah! if you ask me, this is the function idea I most want to see come true, with this I could, for example, made one single vehicle, the Declasse Tornado, and include every version inside the same vehicle, like a rat rod, drag, rusty, etc. And make every version has a different performance. Another example, a Canis Mesa, going from civilian urban version, passing thru an offroad design, getting a rock crawler and finishing with a military grade vehicle. (hope my idea is clear after all) Much like Need for Speed Payback system. Edit: the bands I mentioned are called timing belt, my father (which is a mechanic) usually call them bands or just belts so, forgive me about my error. Camshaft could be a good name for the function. Still having bugs with windows. But on the other way. Through side windows inside chassis in some models not visible other windows, that attached to this detail (glass detail). All windows have same material. And one more global bug. Your mod cause crashes. When lot of Vehfuncs cars installed, game crashes every 10-15 minutes, if Vehfuncs cars near in traffic, crashes faster. Game almost clear. If delete Vehfuncs no more crashes. My friend have same problem and deleting Vehfuncs helps him too. Last should be fixed as soon as possible. Because of it very hard to play. I can confirm that. 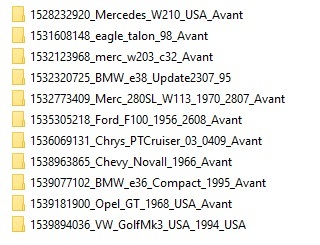 I use almost all cars of Avant in my installation and I made the later ones with vehfuncs spawning in one cargroup together. I have random crashes that make the game almost unplayable. After mixing the cargroups so that only one or at maximum two cars with vehfuncs spawn in the area, it becomes much better. What do you mean by "a lot"? And which functions? This does not occur in GTA Brasil, where a large proportion of vehicles use VehFuncs functions (maybe 20 or 30 vehicles? ), mainly recursive extras, and there is no crashes have been reported. Even after 2 hours of gameplay (the only crashes that were found on that mod are related to anims and textures, VehFuncs doesn't work with anims and textures). The error can be bad vehicle adaptation, or really some problem in some very specific function (e.g. digital speedometer, which isn't used by GTA Brasil). Update intended for advanced users, and also important for the Tuning Mod v3. Added possibility to read and write the value of the vehicle's seed using script (which determines how the parts of it will be generated). Usually you'll spawn some car, and if it spawns the way you want it (for example a service car with a ladder), use the function to read the seed, write it down, and now when you create a car and apply this seed to it, will always be generated with that ladder. This is useful for various types of script mods and it's very easy to use. Added possibility to read the "real" speed of the car. Useful for mods that need a realistic speed like speedometer mods on the screen. Simply call the VehFuncs that it will do all the speed calculation accurately and realistically: here. Cars adapted relying on your's tutorial on github. I think it's because of incompatibility with usual extras (extra1, extra2 etc). Glass bugs causing usual extras with alpha chanell used. So, i think that crashes also from extras incompatibility. Also, crashes began after vibrating details was added to script. Well, I repeat what I said before. Here's your log. Game stucked, closed using task manager. Sometimes crashes, sometimes stucks. Cars you can get here, if you need unlocks, i can provide it. CLEO library version 4031300 found at "CLEO.asi"
Reading profile named "Default" at "modloader.ini". Mod Loader has started up! Opening file for streaming "MODELS\GTA3.IMG"
Loading default font values "DATA\FONTS.DAT"
Loading default vehicles handling "HANDLING.CFG"
Loading default surface adhesion limits "data\surface.dat"
Loading default surface infos "data\surfinfo.dat"
Loading default surface audio infos "data\surfaud.dat"
Loading default ped stats "DATA\PEDSTATS.DAT"
Loading default decision maker "RANDOM.ped"
Loading default decision maker "m_norm.ped"
Loading default decision maker "m_plyr.ped"
Loading default decision maker "RANDOM.grp"
Loading default decision maker "MISSION.grp"
Loading default decision maker "GangMbr.ped"
Loading default decision maker "Cop.ped"
Loading default decision maker "R_Norm.ped"
Loading default decision maker "R_Tough.ped"
Loading default decision maker "R_Weak.ped"
Loading default decision maker "Fireman.ped"
Loading default decision maker "m_empty.ped"
Loading default decision maker "Indoors.ped"
Loading default decision maker "RANDOM2.grp"
Loading default time cycle properties "TIMECYC.DAT"
Loading default population cycle properties "POPCYCLE.DAT"
Loading default plants surface properties "PLANTS.DAT"
Loading default anim association "DATA\ANIMGRP.DAT"
Opening file for streaming "MODELS\GTA_INT.IMG"
Loading default stream config "stream.ini"
Loading default fighting data "DATA\melee.dat"
Loading default level file "DATA\DEFAULT.DAT"
Loading default level file "DATA\GTA.DAT"
Opening file for streaming "data\paths\carrec.img"
Opening file for streaming "data\script\script.img"
Opening file for streaming "models\cutscene.img"
Loading default object types "data\default.ide"
Loading default object types "data\vehicles.ide"
Loading default object types "data\peds.ide"
Loading default object types "data\maps\generic\vegepart.ide"
Loading default object types "data\maps\generic\barriers.ide"
Loading default object types "data\maps\generic\dynamic.ide"
Loading default object types "data\maps\generic\dynamic2.ide"
Loading default object types "data\maps\generic\multiobj.ide"
Loading default object types "data\maps\generic\procobj.ide"
Loading default object types "data\maps\la\lan.ide"
Loading default object types "data\maps\la\lan2.ide"
Loading default object types "data\maps\la\las.ide"
Loading default object types "data\maps\la\las2.ide"
Loading default object types "data\maps\la\lae.ide"
Loading default object types "data\maps\la\lae2.ide"
Loading default object types "data\maps\la\law2.ide"
Loading default object types "data\maps\la\law.ide"
Loading default object types "data\maps\la\lawn.ide"
Loading default object types "data\maps\la\lahills.ide"
Loading default object types "data\maps\la\laxref.ide"
Loading default object types "data\maps\sf\sfn.ide"
Loading default object types "data\maps\sf\sfs.ide"
Loading default object types "data\maps\sf\sfse.ide"
Loading default object types "data\maps\sf\sfe.ide"
Loading default object types "data\maps\sf\sfw.ide"
Loading default object types "data\maps\sf\sfxref.ide"
Loading default object types "data\maps\vegas\vegasn.ide"
Loading default object types "data\maps\vegas\vegass.ide"
Loading default object types "data\maps\vegas\vegase.ide"
Loading default object types "data\maps\vegas\vegasw.ide"
Loading default object types "data\maps\vegas\vegaxref.ide"
Loading default object types "data\maps\country\countryn.ide"
Loading default object types "data\maps\country\countn2.ide"
Loading default object types "data\maps\country\countrys.ide"
Loading default object types "data\maps\country\countrye.ide"
Loading default object types "data\maps\country\countryw.ide"
Loading default object types "data\maps\country\counxref.ide"
Loading default object types "data\maps\interior\int_la.ide"
Loading default object types "data\maps\interior\int_sf.ide"
Loading default object types "data\maps\interior\int_veg.ide"
Loading default object types "data\maps\interior\int_cont.ide"
Loading default object types "data\maps\leveldes\levelmap.ide"
Loading default object types "data\maps\leveldes\levelxre.ide"
Loading default object types "data\maps\interior\gen_int1.ide"
Loading default object types "data\maps\interior\gen_int2.ide"
Loading default object types "data\maps\interior\gen_intb.ide"
Loading default object types "data\maps\interior\gen_int3.ide"
Loading default object types "data\maps\interior\gen_int4.ide"
Loading default object types "data\maps\interior\gen_int5.ide"
Loading default object types "data\maps\interior\savehous.ide"
Loading default object types "data\maps\interior\stadint.ide"
Loading default object types "data\maps\leveldes\seabed.ide"
Loading default object types "data\maps\interior\props.ide"
Loading default object types "data\maps\interior\props2.ide"
Loading default object types "data\maps\interior\propext.ide"
Loading default object types "data\maps\veh_mods\veh_mods.ide"
Loading default object types "data\txdcut.ide"
Loading default object data "DATA\OBJECT.DAT"
Loading default vehicle colours "DATA\CARCOLS.DAT"
Loading default vehicle upgrades "DATA\CARMODS.DAT"
Loading default train track "data\paths\tracks.dat"
Loading default train track "data\paths\tracks3.dat"
Loading default train track "data\paths\tracks2.dat"
Loading default train track "data\paths\tracks4.dat"
Opening file for streaming "MODELS\PLAYER.IMG"
Loading default clothes rules "DATA\CLOTHES.DAT"
Loading default water level "DATA\water.dat"
Loading default ped relationship data "DATA\PED.DAT"
Loading default weapon data "DATA\WEAPON.DAT"
Loading default ped groups "PEDGRP.DAT"
Loading default car groups "CARGRP.DAT"
Loading default action reaction stats "DATA\AR_STATS.DAT"
Loading default stat update conditions "DATA\STATDISP.DAT"
Loading default shopping data "data\shopping.dat"
Loading default furniture data "data\furnitur.dat"
Loading default procedural objects "data\procobj.dat"
There is no crash there, so it doesn't help. And you'd better tell exactly which cars you have installed in the game, or if possible, find exactly which car (or cars) is causing this. I don't want to download and install 20 cars and spend half an hour testing and failing to reproduce the crash. btw I updated the mod now, just to fix a little bug, nothing important. VW Golf Mk3 and Mk2, Opel GT, BMW e36 Compact, Chevy Nova II SS, PT Cruiser, Ford F-100, Mercedes w113 280SL, Mercedes w203, Eagle Talon, BMW e38. Mercedes w210. Other cars, that i installed don't have Vehfuncs adaptation. Let it installed, but I doubt it will help... crash again (not freeze), please send the log. It's crashing rarely, the most time it's just stuck, with sound "blind". Okay, thanks, i will try it today. Problem: Apparently some vehicle with bugged model. Solution 1: Check your vehicles, Vehicles Crash can help with it. Solution 2: If you use AVP Reborn: Found by Luiz Felipe: Remove or replace Police Rancher (copcarru.dff and txd) from AVP Reborn. Remembering that AVP Reborn has been updated to fix crashes on other cars too, so download it if it did not download. But I'll keep testing to find other crashes. edit: may be caused by VehFuncs, tested 1 hour without VehFuncs and there is no crash. edit: new crash now, 0x004C7DAD, related to wheels (wheel was not found or something like this), about the model itself and not the car instance. VehFuncs only changes the car instance, so, good luck. edit: more 3 times, apparently this 0x004C7DAD is related to unloading. Started after I changed the stream memory limit to 64 MB in MixSets. Also, once caused crash just after the map starts blinking with LOD several times. So, i don't know what is AVP and don't want to. I tested my cars and stuck on one. First one was solair (Audi 80 Avant, it have no Vehfuncs, so this is very strange), but i replaced it with original and all became good with this car. The second is stratum. I have PT Cruiser on it. PT Cruiser's Vehfuncs vibration done by unusal way. The vibrating parts were upper chassis_dummy, because only that way it's was no bug with windscreen and doors. I think, need to make an bugfix, that will make able to do an vibrating parts out from chassis_dummy too. And also one more bug, it's old. UPD: even after 14x vehicles test still stucking when riding to Los Santos. Also, one time stucked when was spawning golf 3. Unhandled exception at 0x007336AE in gta_sa.exe (+0x3336ae): 0xC0000005: Access violation reading location 0x70B1E354. Unhandled exception at 0x007336AE﻿ in gta_sa.exe (+0x3336ae): 0xC0000005: Access violation reading location 0x70B1E354. This crash is in function "RenderWeaponCB", well, weapon rendering. It's best that you send the end of modloader.log, not just this line. Try this. I think I made an important fix. Wow, 50 minutes, no crashes. Apparently has been fixed, test it to be sure. The main download was updated. Wow, bug with comperssion on z axle is really fixed. Thanks! But, the game still stucking, when going from Los Santos to Countryside, through beachside. The last log here, after crash in Los Santos. Unhandled exception at 0x004C53A6 in gta_sa.exe (+0xc53a6): 0xC0000005: Access violation writing location 0xCB879B88. Now thought about RagDoll Physics, that mod is also installed in my game. Will try to delete it and watch to game. Still crashing, even without it. Unhandled exception at 0x004C53A6 in gta_sa.exe (+0xc53a6): 0xC0000005: Access violation writing location 0xCB877328. Tested again, 40 minutes (10 minutes on countryside), no crashes. Seeing that this crash was already reported even when VehFuncs did not yet exist, may be related to problem with some other car model. I always test in the exact same way, starting in Santa Maria Beach with a Merit or Blista, and sometimes changing the car. Running around Los Santos, but also entering inner city streets. I am amazed, i had found the reason. My gameconfig is SkyGFX+MixSets, and there was memory2048 installed also. Deleted it, and set 2048 in MixSets.ini, working good for now. I think, it's needed to be pinned to theme's hat. I'm sorry, that i was thought something bad about this mod. Thanks for your attention and attempts to help. Can i offer some ideas to add? - Detail shaking. Can be easily based on chassis_shake, that supported by default, by handling flag. Not vibrate, shake around point. - Third. Rear axle for cars. I tried to make it though VSA and misc_d inside vehicle, but that way, the axle skewed by z axle. Deleted it, and set 2048 in MixSets.ini﻿, working good for now. This isn't really a fix, this will make the cars never be removed from memory until it hits 2048 MB, so, if the problem happens only when the car is removed from memory, you will "never" see that problem again... and when the game hit that 2048 MB (which is something very difficult, need a lot of HD mods), if it is not using largeaddress, it will cause runtime error. Theoretically if you lower the value will increase the crashes (remember that MixSets replaces the value of any other mods). Anyway, I tested again, I decreased to only 64MB, the map and vehicles was constantly being deleted from memory and loaded again, and did not cause any crash in 20 minutes (before the fix, was crashed in only 5 minutes). Firstly, it's will be good, if you will add one more function to f_shake, that will make detail vibrate more (2x, 3x etc power) with accelerating. Yes, I think of making parts that "swing", I'll try to do something with it, otherwise I'll need to create a new system. I will leave things related to suspension, traction etc for the future. May be, it's will be useful, to detect what can conflict and create crashes. Unhandled exception at 0x004C53A6 in gta_sa.exe (+0xc53a6): 0xC0000005: Access violation writing location 0xEB9132F0. Unhandled exception at 0x004C53A6 in gta_sa.exe (+0xc53a6): 0xC0000005: Access violation writing location 0x6B9628EC. Crash code is different sometimes, i will add log, if see other.